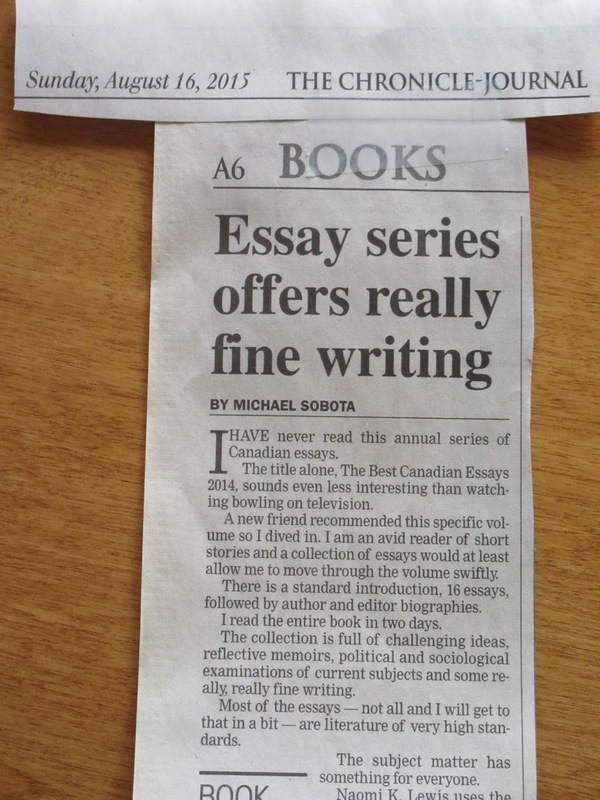 A couple of weeks ago, local artist/director/activist/writer/arts-supporter Michael Sobota reviewed Best Canadian Essays 2014 for the Thunder Bay Chronicle-Journal. Theoretically, the review will appear online, but who has that kind of time? It's impossible to read the whole review in the photo above, so I'll pull out some important points. "I read the entire book in two days." "The collection is full of challenging ideas, reflective memoirs, political and sociological examinations of current subjects and some really, really fine writing." He cites Naomi K. Lewis, and her reflection on anti-science policymaking in Canada, and Sarah De Leeuw's examination of film festivals as particularly relevant and engaging pieces. And yes, he says nice things about my essay, "Words," as well ("beautifully structured, vulnerable and wise"--wise? I wish!). Thanks, Michael! "The Best Canadian Essays 2014 should find a place of honour in your travel bag, on the deck at your camp, by the reading window in your breakfast nook, at your bedside table." 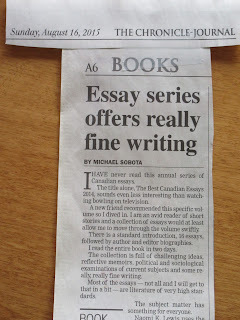 Published by Tightrope Books, this series represents an interesting cross-section of Canadian writing. (And yes, I'd say that even if my work hadn't been in it twice.) Editors read the entire year's worth of Canadian periodicals and select a wide-ranging assortment of work. Just to show the editors' breadth of reading, here are just a few of the periodicals that first published this year's essays: Room, Lemonhound.com (sadly, no more), Alberta Views, Up Here, Prairie Fire, POV, Walrus, and The New Quarterly. It's a worthy collection and series, and I suspect it doesn't get the attention it deserves. If you order it from the publisher or through your local bookstore, you're supporting several worthy enterprises. Thanks again, Michael, for your review!